Indeed, a "miracle" is needed in order to defend the Catholic Faith, the family, marriage require it most urgently. God's intervention is most surely needed in the Synod in order for the Church to resoundingly reject that which is a danger to souls, a danger to the family and a direct assault on the sanctity of marriage and upon the Holy Eucharist. So what 'concrete solutions' does His Holiness have in mind that would emerge as part of the "miracle?" What 'hour of Christ' does His Holiness mean? "Watch ye therefore, because you know not the day nor the hour"? "This is your hour - the reign of darkness"? "Father, save me from this hour"? Help me, I speak as one of the Chief Shepherd's flock. I am so confused it is as if I am looking at the world's most complicated and mysterious enigma. Christ's 'hour' is surely the final vanquishing of all evil and the full establishment of His justice, as well as the glorification of His mercy, in His Kingdom when He comes in glory as Judge, and, what is more, this will not abide by the 'law of graduality'. This will be in the blink of an eye. "...not my will but Thy will be done..."
...is surely our prayer! I hope that the 'concrete solutions' His Holiness is praying for in his intentions is in line with the prayer taught to us by Our Lord which we dare to say. Unfortunately, Pope Francis has with his 'concrete proposals' intention, given us cause to wonder if it is truly the will of God that is being sought. Do read a good article at One Peter Five on Our Lady of Good Success. It seems relevant, given that Pope Francis is in Ecuador. I too have a 'concrete proposal'. I thought that things had started to settle down a bit. Indeed, I thought that some of Pope Francis' homilies and speeches in recent times very much better than some of his earlier ones. Although, I cannot get out of my mind the fact that his closest friends appear to be Cardinals whom I just cannot trust eg. Marx, Maradiaga and of course Kasper. Plus I cannot forget the influence of Archbishop Forte and Cardinal Baldisseri. Nevertheless,my opinion of Pope Francis had been going upwards until these quotes. . .
Usually with me and Pope Francis, it is one step forward and two steps back! It is difficult not feel alarmed at these words from the Pope today. Surely, our conscience recoils at that which is "impure, scandalous or threatening". Our conscience cannot accept these things and we quite rightly would want to turn away and not be led astray by such things. Yet the Pope seems to be asking us to pray fervently that our Lord will take evil?? and make it into good?? and that although we would not normally accept such things in conscience, we should pray to the Lord to dispose us to accept such things. I cannot read the Pope's words without feeling alarmed. It is also difficult not to read the Pope's words as at least implictly favouring the Kasper heresy?? 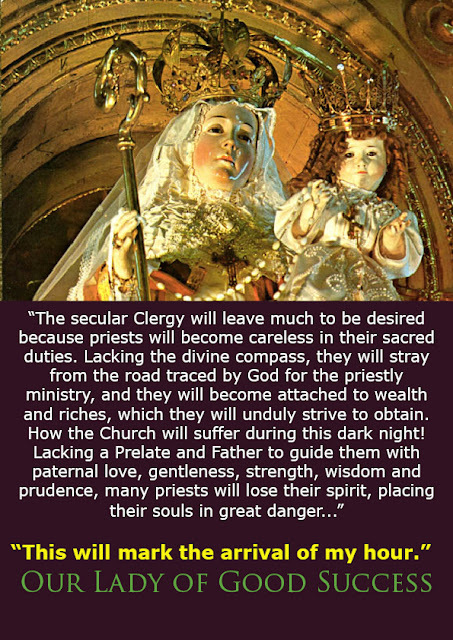 Is this not the heresy which we hear often condemnded as scandalous and threatening to our Catholic faith????? I would like t offer one point, Bones, regarding your very good post. Pope John Paul 11 speaks of the 'law of graduality' which means that persons often give up on sin gradually, becoming more refined in their renouncing of it as they progress spiritually toward Christ. It takes time, especially when one is steeped in a habit of serious sin. This same pope goes on to explain that 'there is no graduality of the law.' We are weak, flawed, sinful creatures who work toward full keeping of the Law of God. The Law of God does NOT become gradual to accommodate us. For example, a woman who has been sexually promiscuous for many years, and has finally reached the point where she is sexually faithful to one man, a man whom she is planning to marry, is NOT free to receive the Holy Eucharist even though she is working toward the sacrament of Matrimony and gradually coming to fullness of compliance with God's Law. It is just such twisting of concepts that the present regime of Rome is counting on to confuse the issues now before us. Let us indeed pray very much-- because oh so much is at stake. Thanks for your good post. Agree about the 'concrete solutions' rhetoric. It is as if the Rock of the Church, not long ago, spontaneously crumbled into a pile of sand, and it is up to these 'intrepid' prelates of the update to find the right paste to make a new structure out of the scatterings. "The family “cannot be replaced by other institutions"...therefore they will tear it to shreds and reconstitute it so as make of it something more suitable to a system that places God at the bottom (strickly lipservice only even there), human units next, and the United Nations and her Olympians at the top. (If you are looking for the 'Church' in this New World Order model, it figures as a PR wing of the UN). "Indeed a miracle is needed" - sure is, if the inherent integrity which God revealed in His teaching on the family is to be protected from people calling themselves 'church'. May God bless you for highlighting this. To add to the troubling nature of these words is the fact that they were issued on the day when the Church celebrates St. Maria Goretti. What a contrast and seeming inversion this appears. Does anyone know whether Pope Francis mentioned those Church-approved messages and warnings of Our Lady of Quito during the time he spent there? We were shown a video of these a few years ago and recommend them to sincere Catholics in these times. They can be a source of deep consolation. One of the key things that Our Lady of Quito taught was that - though there will be a very dark time when all will seem lost for the Church - in the end Our Lord, Our Lady and the Church will be victorious. Would that another lightning bolt would strike the Vatican-- more particularly the Hotel Saint Martha. If conversion is still possible I pray he converts; if not I pray for early retirement, although with the current batch of cardinals, the next papal conclave may as well take place in the Vatican bathhouse. I recently met a Phillipino man who was formerly a practicing Catholic priest. While a young man, he was sent to work in the Vatican. He was was so shocked and horrified by the rampant homosexuality amongst the high level clergy that he quit the priesthood. That was about 40 years ago. Later he married and now has a family. I am good friends with his sister in law. I suppose it could be that he is saying that certain things said at the Synod were " impure, scandalous or threatening" but that a miracle should put them right. However I cannot see why one needs a miracle to follow the teaching of the Church - just accept grace and use common-sense. Since when do we add to God's suffering in His "hour" by laying even more of our sins on Him? I thought we were supposed to ask God to *forgive us* our sins - not to take a minute out of His Gethsemane to take on more of ours. In Pope Francis' scenario, we ask God to carry the burden of our sins because - hey - it looks like we're going to keep sinning - stopping is beyond us - but maybe if we dump them on God He can either 1) suffer with them or 2) make them vanish with His magic wand. Sounds like a plan! Keep sinning, knowing there's no way we can stop it! This, of course, makes Christ our servant - how wonderful! I always wanted a servant who would take on my debts for me while I party on. Nice. I am forever struck by the uncanny parallels between Bergolio and Obama (both rising to prominence from utter obscurity) and the "¡Vaya lío! "lawlessness of each, one the political face and the other the religious. That the two will meet in September sends a chill down my spine. Pray indeed for Bergolio. Pray the rosary! Whatever he's got planned, you can be sure it's nothing good. His deafening silence on Ireland and the SCOTUS destruction of marriage perhaps give us a clue, no? dark is light and light is dark, that bitter is sweet and sweet is bitter." On cue, Fr Lombardi has spun the Pope's words to say they mean that Our Lord will take the scandalous and impure and transform them into good by the grace of conversion. Of course, they could mean that because of the ambiguity which accompanies nearly everything that he says. But in the context of the rest of his speech, they seem to sound more like an utterance of antichrist. It must take real forethought and a high degree of linguistic skill to preserve this aura of ambiguity which he achieves constantly. Day by day I grow more convinced that Our Lord is not the master that Bergoglio serves. To come out with this in Quito is tantamount to flaunting his "superior" understanding of the faith in Our Lady's face. I suspect that the Synod will be the occasion for his diabolic "coming out" as he tries to silence those who remain faithful. Indeed, "hot-beading" is desperately needed at this time. It is blasphemy. Unmitigated blasphemy. Reparation! "...Sister Lucy also said to me: 'Father, we should not wait for an appeal to the world to come from Rome on the part of the Holy Father, to do penance. Nor should we wait for the call to penance to come from our bishops in our diocese, nor from the religious congregations. No! Our Lord has already very often used these means, and the world has not paid attention. That is why now, it is necessary for each one of us to begin to reform himself spiritually. Each person must not only save his own soul but also help to save all the souls that God has placed on our path. The devil does all in his power to distract us and to take away from us the love for prayer; we shall be saved together or we shall be damned together'." Sister Lucy told me Fr. Fuentes): "The two means for saving the world are prayer and sacrifice." She said to my cousins as well as to myself, that God is giving two last remedies to the world. These are the Holy Rosary and devotion to the Immaculate Heart of Mary. These are the last two remedies which signify that there will be no others." Regarding the Holy Rosary, Sister Lucy said: "Look, Father, the Most Holy Virgin, in these last times in which we live, has given a new efficacy to the recitation of the Rosary. She has given this efficacy to such an extent that there is no problem, no matter how difficult it is, whether temporal or above all spiritual, in the personal life of each one of us, of our families, of the families of the world or of the religious communities, or even of the life of peoples and nations, that cannot be solved by the Rosary. There is no problem I tell you, no matter how difficult it is, that we cannot resolve by the prayer of the Holy Rosary. With the Holy Rosary we will save ourselves. We will sanctify ourselves. We will console Our Lord and obtain the salvation of many souls." Two workers for the NWO world government.